Chef Michael White adds to the dining scene on the Upper East Side with Ristorante Morini, an upscale version of his SoHo restaurant Osteria Morini. The menu features many dishes from White's other venues (Marea, Costata, Ai Fiori, to name a few) as well as items unique to this restaurant. Dinner nightly. Ristorante Morini, 1167 Madison Ave., New York, NY 10028, 212-249-0444. The Peacock and The Shakespeare are located inside the new hotel, The William. The Peacock is an elegant parlor serving elegant English fare, while The Shakespeare, down below, is an English-style pub serving up hearty pub grub. The Peacock and The Shakespeare, The William, 24 E. 39th St., New York, NY 10016, 646-837-6776. Fogo de Chao, the chain of Brazilian steakhouses, has opened its first location in New York City. Waiters roam about the massive three-floor space in Midtown offering grilled meat to empty plates. Meats include top sirloin, pork loin, sausage, beef ribs, bottom sirloin and rib-eye. Fogo de Chao, 40 W. 53rd St., New York, NY 10019, 212-969-9980. A new restaurant in Hell's Kitchen, Bea puts an emphasis on craft cocktails and American-style tapas. Dishes include pork dumplings with ginger and a branzino filet. Bea, 403 W. 43rd St., New York, NY 10036, 212-602-1910. Located in Harlem, The Park 112 is a 2,000-square-foot space with a kitchen serving the cuisine of the West Indies. Dishes include carrot coconut soup, crispy prawns, and jerk chicken rolls. The Park 112, 2080 Frederick Douglass Blvd., New York, NY 10026, 646-524-6610. In January 2014, chef Jean-Georges Vongerichten (Jean-Georges, JoJo, ABC Kitchen and others) will open The Inn at Pound Ridge by Jean-Georges. The restaurant, located in Westchester County, New York, will have a farm-to-table focus. The Inn at Pound Ridge by Jean-Georges, 258 Westchester Ave., Pound Ridge, NY 10576, 914-764-1400. From the owners of Battersby comes Dover, which is offering a seafood-leaning menu. Dover, 412 Court St., Brooklyn, NY 11231, 347-987-3545. Iconic Grand Central Oyster Bar & Restaurant, located in the most famous railway station in the United States, has made the jump across the East River to Park Slope, Brooklyn. Grand Central Oyster Bar & Restaurant Brooklyn, 256 Fifth Ave., Brooklyn, NY 11215, 347-294-0596. Dominique Ansel, baker extraordinaire at Dominique Ansel Bakery and creator of the cronut, has announced the cronut flavor for the month of January: peanut butter. Dominique Ansel Bakery, 189 Spring St., New York, NY 10012, 212-219-2773. Three Times a Charm for Stupak? Chef Alex Stupak, who runs the kitchens at Empellon Cocina and Empellon Taqueria, has recently said he'd like to open a third restaurant. Rumors are swirling that the chef's next eatery will be at the now-vacant space on the corner of St. Marks Place and Avenue A. No definitive word yet on what type of restaurant it might be. Empellon Cocina, 105 First Ave., New York, NY 10003, 212-780-0999. Word on the street is that Daniel Boulud is scouting locations way downtown --- as in the Financial District --- for an outpost of his popular Upper West Side shop/eatery Epicerie Boulud. The plan is for the epicerie to open sometime in 2015. Epicerie Boulud, 1900 Broadway, New York, NY 10023, 212-595-9606. The River Cafe, located on the Brooklyn waterfront, has been shut for over a year. Severe damage from Hurricane Sandy forced the restaurant to close. But the restaurant is finally reopening February 1, 2014. The River Cafe, 1 Water St., Brooklyn, NY 11201, 718-522-5200. 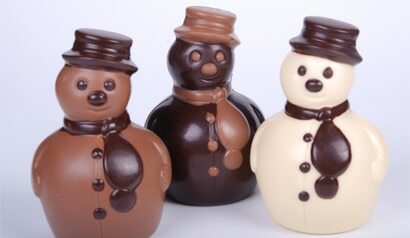 The holiday collection is now available at Jacques Torres Chocolate, featuring chocolate snowmen, gingerbread men, Santas and more. Through January 5th, $5 from each special edition Jacques Torres malt ball box ($25/16oz) will be donated to the local non-profit ProjectArt. The holiday collection can be found at the Jacques Torres Chocolate stores (Hudson St, Rockefeller Center, Upper West Side and DUMBO) as well as a few holiday pop-up shops (1188 3rd Avenue, 110 East 57th Street, 41 West 40th Street). For more information, visit www.mrchocolate.com. Jacques Torres Chocolate, 66 Water St., Brooklyn, NY 11201, 718-875-9772. Umami Burger, the Los Angeles-based burger chain that recently opened up its first outpost in New York City, has just unleashed the $65 hamburger. The M.N.O. Burger, an acronym for "Money's No Object," features Wagyu beef finished with shavings of white truffles. For $10 more, you can get a slab of foie gras on top. Umami Burger, 432 Sixth Ave., New York, NY 10011, 212-677-8626. Aska, the acclaimed Scandinavian restaurant in Williamsburg, is now offering a three-course dinner at the bar. The meal costs $39 and can be paired with the new line-up of winter-inspired cocktails. Aska, Kinfolk Studios, 90 Wythe St., Brooklyn, NY 11249, 718-388-2969. Sirio Ristorante, the restaurant inside The Pierre, A Taj Hotel, New York, is reinstituting Musical Mondays during the holidays. Every Monday evening, gentle live music will serenade diners. A $38 prix-fixe dinner is offered. Sirio Ristorante, The Pierre, A Taj Hotel, New York, 795 Fifth Ave., New York, NY 10021, 212-940-8195. The group behind Umami Burger has announced it’s bringing another LA-based restaurant to the Big Apple. Sometime in 2014, the pizzeria 800 Degrees will open, and shortly after that, duplicates will fire up their pizza ovens, including outside of Manhattan. The first location and flagship is rumored to be around Madison Square Park. Abram Bissell (The NoMad) has been named the new chef at The Modern. He replaced Gabriel Kreuther, whose last day was February 12, 2014. The Modern, The Museum of Modern Art MoMA, 9 W. 53rd St., New York, NY 10019, 212-333-1220. Travis Swikard is the new executive chef at Boulud Sud. He was previously executive sous chef and has been at the restaurant since it first fired up its burners in 2011. He replaces Aaron Chambers, who has moved to another position in the Boulud world. Boulud Sud, 20 W. 64th St., New York, NY 10023, 212-595-1313. Tamarind, the well-loved Indian restaurant located in the Flatiron District, will close by the end of the year. The good news is that its spin-off, Tamarind Tribeca, will remain open. Tamarind, 41-43 E. 22nd St., New York, NY 10010, 212-674-7400. The Broadway location of longtime restaurant Silver Spurs has shut down. Fans of the barbecue establishment can breathe easy, though: the Greenwich Village branch of Silver Spurs is still open. Silver Spurs, 771 Broadway, New York, NY 10003, no phone. Alison Eighteen shuttered on December 19. The owners of Recette will take over the space and open a new restaurant on the site. Alison Eighteen, 15 W. 18th St., New York, NY 10011, no phone. The original Fatty 'Cue, alongside the Williamsburg Bridge in Brooklyn, has closed. It’s being transformed into a space for private parties and recipe experimentation called Fatty Lab. Fatty 'Cue, 91 S. 6th St., Brooklyn, NY 11249, no phone. Lievito Pizzeria in the West Village has closed and a new restaurant, likely of the Italian variety, will open up in the space next year. Lievito Pizzeria, 581 Hudson St., New York, NY 10014, no phone.